Martha Giannakopoulou graduated from the Architectural Association in London in 2001, receiving Riba I,Riba II, AADipl, and was awarded the "The William Glover award” for her diploma thesis. 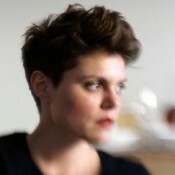 She worked as an urban designer for Ove Arup UK until she founded her practice in 2003 IF-[ untitled ] architects (www.if-untitled.com), a London-Athens based architectural studio. The studio’s work encompasses a broad spectrum of cultural and social contexts on architectural projects as well as international development projects in countries such as UK, Greece, Japan, India, Indonesia, Zambia and Rwanda. Works have been shortlisted in 2010 and 2011 for the -YAYA Award- Young Architect of the Year Award in the UK, exhibited at the 6th Biennale of Young Greek Architects in 2010 and 2012, and published in various Greek and European magazines. From 2008 onward, Martha Giannakopoulou has been the lead coordinator of Pecha kucha Athens and has organized and curated 6 events, including gathering 60 renowned speakers from the different disciplines of art and design. She was the Founder and Director of the Circle of Arts, a non-profit organization for the promotion of the Arts and Architecture in Athens; Volume One – Props, Events and Encounters 2010, international contemporary sculptural exhibition, 45 Bands in 50x70-2012, 35 Greek Artists for Democracy, 2011. Martha Giannakopoulou has been a visiting critic at the Architectural Association, London Met and East London. She has also lectured on collaboration, community design and urban sustainability in various architectural and humanitarian conferences in Athens and London. Since being awarded the Fulbright scholarship, she has been working as a visiting researcher and critic at the Cooper Union Institute of Sustainable Design for the SUSTAIN Rockefeller Innovation Grant.